Looking for a delicious brat recipe? These grilled kabobs are super easy to make. They are bright, colorful, delicious, and fun to grab to pick up to eat. Make these brat kabobs for a busy weeknight family meal or your next back yard barbecue. *I was given a free Boozy Bundle of Booze Dogs to sample and give my honest opinion. I was not compensated for this post. I was recently contacted by Booze Dog’s to try their liquor infused bratwursts. They assured me I would love their smoked, small batch, booze marinated pork bratwursts with no synthetic flavorings. They shipped me a container of their Boozy Bundle so I could sample all of their flavors. 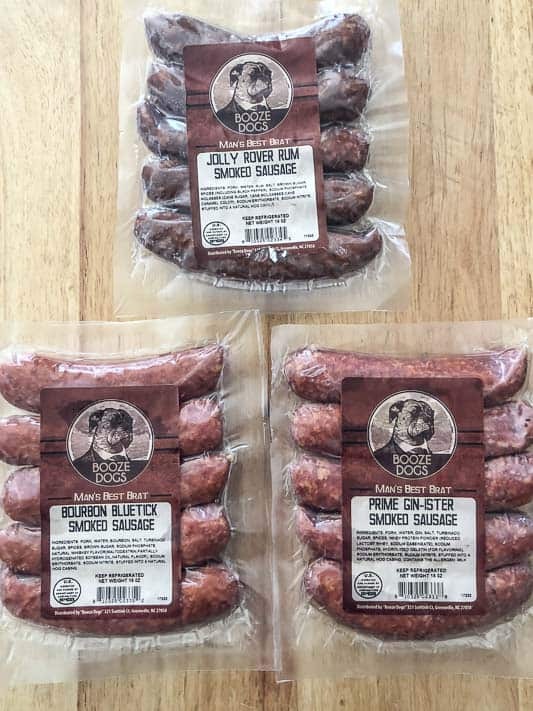 I received a package of their Jolly Rover Rum Smoked Sausage, Bourbon Bluetick Smoked Sausage, Prime Gin-Ister Smoked Sausage. They were all delicious. You could taste the alcohol in each of them. However, the liquor was very complementive and not over-powering. They had a nice crispy skin and were leaner than the typical brat. The booze dogs were great to eat as a typical brat dog on a bun with all of your favorite fixings…. but I wanted to make something a little different. I thought making these Grilled Kabobs would be fun. I love a grilled brat and I love grilled veggies. Why not add the combination to a stick? The sweetness from the vegetables complimented the salty liquor infused brats. The colors look beautiful. It makes a fun meal anyone would love. The vegetables marinade for 4 hours, however, cooking only takes 15 minutes on the grill! How easy is that? I invited some friends over to eat the brat kabobs with us. Good food is always meant for sharing. They made a fun family/friend dinner. 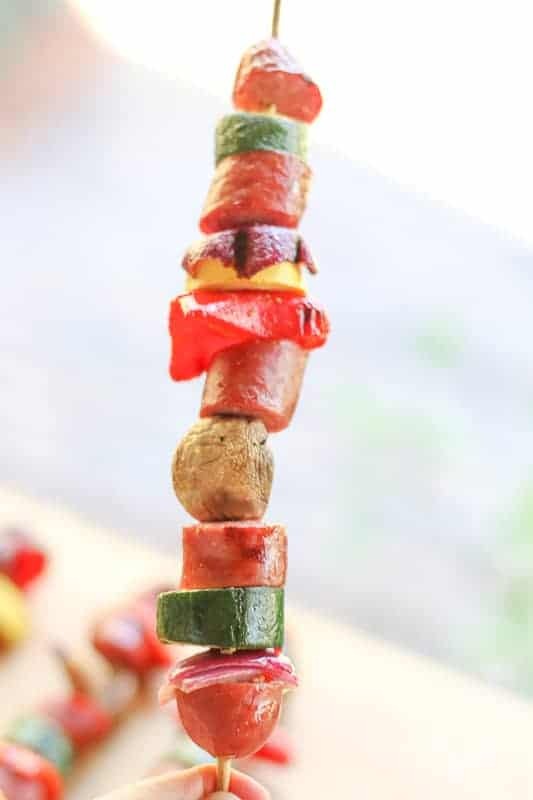 However, these grilled kabobs would be perfect for a backyard party or tailgating. You could just pick them up and eat them right off the stick. Enjoy! *Note: Use this homemade Italian Salad Dressing recipe if you do not want to use a store bought brand. If you like this recipe, check out: Grilled Buffalo Chicken Wings, Sriracha Grilled Zucchini, and Grilled Stuffed Flank Steak. Looking for a delicious brat recipe? These grilled kabobs are super easy to make. They are bright, colorful, delicious, and fun to grab to pick up to eat. 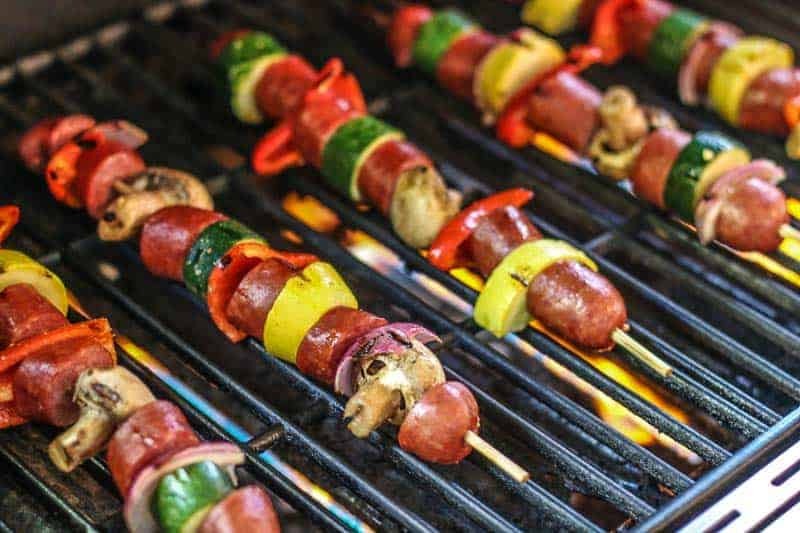 Make these brat kabobs for a busy weeknight family meal, tailgate, or your next back yard barbecue. 1 lb Brats, thickly sliced I recommend a Booze Dog Variety. In a large bowl, mix vegetables with Italian Salad dressing. Marinade for 4 hours. Alternatively thread brats and vegetables on skewers. Grill for 10 to 15 minutes until brats are completely heated and vegetables are completely cooked. Thank you so much for letting me know! I greatly appreciate it! I prepped these for our camping trip Monday morning and we enjoyed them grilled on the fire that evening. They were so easy to prep and very little mess. What a great camping recipe. I couldn’t find the exact sausage that you used, but it was still delicious. Thanks for sharing. We love brats and what a great idea served as kabobs off the grill. Perfect! I have discovered that the family loves brats (but not buns) so I was just looking for a variety of ways to serve them. They’ll love this! Okay, first of all, these kebabs look delicious! But the name “Booze Dogs” has me rolling – I LOVE IT! Man, this recipe is making me jones for summer so I can bbq again. Our bbq is hidden behind a three foot snow drift, so we have some waiting to do. We love kebabs because they’re so darn quick. Loving the idea of using sausage in some variation. Can’t wait for barbecue season to start to impress my guests with these beauties. Love it! I love food that is colorful and fun to eat! 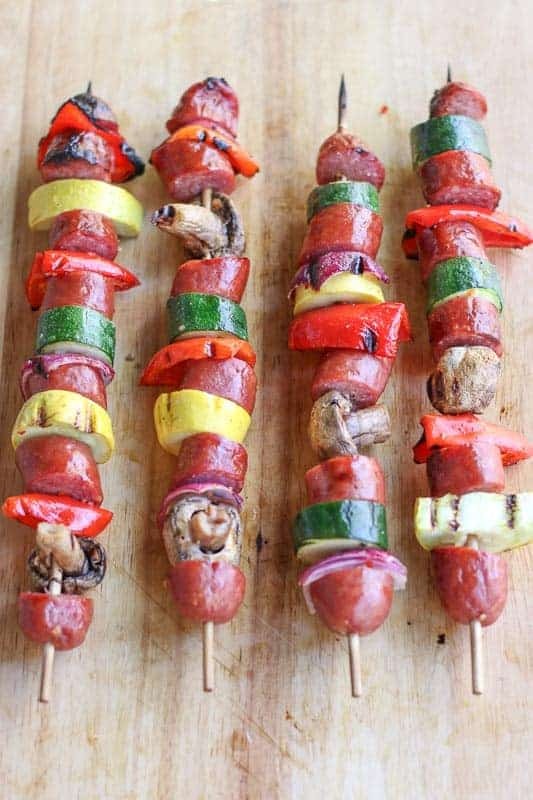 These kabobs are great, my husband would love them, and although I am vegetarian I can see it working for me with tofu or all vegetables. Beautiful! Yum!! I love brats and I’ve never thought of turning them into a kabob. This looks awesome! I can’t wait to try it out the first time I fire up the grill. You can tell just from looking at those brats that they are going to taste amazing! 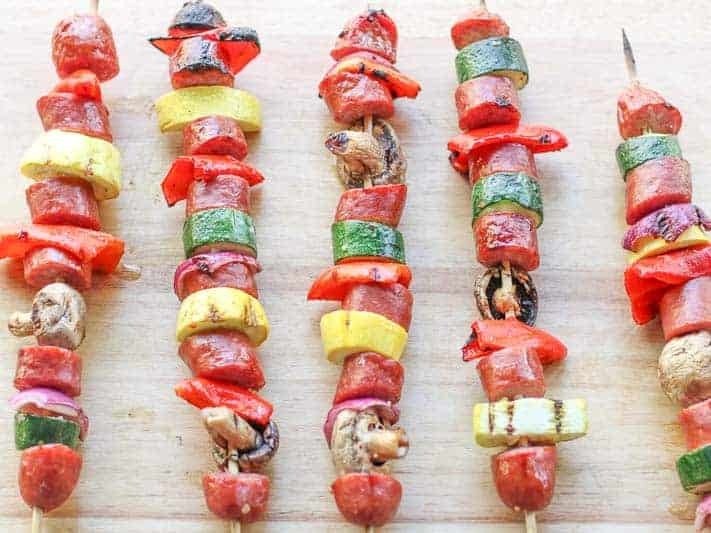 These kabobs look so wonderful and make me dream of summertime and grilling weather already. I’m going to have to make these first chance I get! Such a bright and colourful meal. This is certain to entice the kids into eating more veg! And those brats, they should delicious, and soaked with real booze! YUM! Proper grilling season is RIGHT AROUND THE CORNER and brats are my favorite. I am so looking forward to pulling out my Weber and getting some good griling going. This recipe looks fantastic! These look great! The weather has been great here ( I live in FL ), and I can’t wait to make these over a weekend BBQ. I love a great kebob recipe, especially with brats. You can almost taste summer with this recipe and your amazing pictures! Can’t wait to get the grill going for this recipe soon! This looks like a marriage long overlooked. We are fairly adventurous eaters, I’m in.